Expanded and republished in 2008, The Mary Kay Way: Timeless Principles From America's Greatest Woman Entrepreneur helped celebrate the 45th year of the company she founded. Originally published in 1984 as Mary Kay on People Management, The Mary Kay Way includes contributions from top Mary Kay independent salespeople. 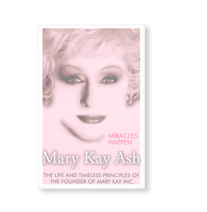 The autobiography of Mary Kay Ash was updated and rereleased in 2003 as Miracles Happen: The Life and Timeless Principles of the Founder of Mary Kay Inc. 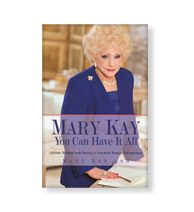 The original autobiography, Mary Kay, was published in 1981 and sold in excess of 2 million copies. Ask your Independent Beauty Consultant how you can buy this book. You Can Have It All: Lifetime Wisdom From America's Foremost Woman Entrepreneur was published in 1995 and is currently out of print. It focused on the priorities of modern women and became a best seller just a day after it was introduced.